Crew Note: Captain Peter L.M. Packard had no regularly assigned combat crew. Captain Peter L.M. Packard arrived as an unassigned 358th BS Pilot. Flew all of his missions as a Squadron Lead Crewman (5 missions) and other missions as a 303rd BG(H) Group Lead Crewman Air Commander. He was one of the very few 303rd BG(H) Pilots who flew 100% of his missions as a Lead Crew member. All missions, except one, were flown in the right seat as a Lead Crew CoPilot. Flew on 23 missions. First 16 missions: (#114) 28 Feb 1944 16th mission 20 July 1944 (#208) with 358th BS Pilots: 1Lt Jack W. Watson (7 missions), Maj. Kirk R. Mitchell (1 mission), 1Lt Arnold S. Litman (2 missions), 1Lt Joseph A. Moreau (4 missions), 1Lt Philip O. Benham (2 missions). Resumed missions on 7 Oct 1944 (#253) with last mission on 1 Jan 1945 (#295) - seven missions with the following Pilots: 358th BS - 1Lt Jack W. Riseden, Capt Willard H. Bergeron, Capt Samuel E. Rosser; 359th BS - Capt John W. Tulloss; 360th BS - 1Lt Roger L. Kuykendall; 427th BS - Capt Richard F. Healy and Capt John E. Fletcher. Served as the 358th BS Operations Officer from 28 March to 25 July 1944. His Lead Crew received a Commendation from B/Gen Robert E. Williams, CG 1st Bombardment Division on 18 May 1944 for their actions on mission #145, 30 April 1944 to Lyon/Bron, France. The commendation stated that the Lead Crew in spite of encountered sporadic fighter interception and intermittent clouds displayed superior teamwork in the execution of the attack with over 52% of bombs hitting within 500 feet of the aiming point. Lead Crewmen on this missions were: 1Lt Jack W. Watson (P), Capt Peter L.M. 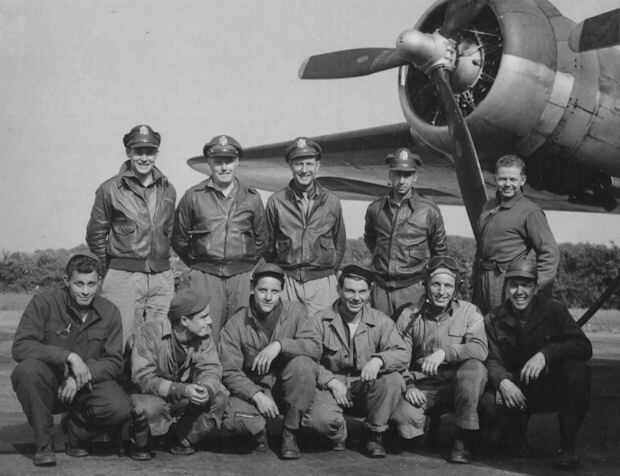 Packard (CP), 1Lt Lawrence C. Merthan (Nav), 1Lt Charles C. Armstrong (Bom), T/Sgt Robert W. Hoffman (E), T/Sgt Christopher Balzanzo (R), S/Sgt Theodore R. Czeczotka (BTG), T/Sgt Francis W. Stender (TG), S/Sgt Robert C. McArthur (RWG), S/Sgt Herbert A.. Daniel.